Alciato at Glasgow: Emblem: echthro^n ado^ra do^ra. In dona hostium. The gifts of enemies are no gifts. On the gifts of enemies. Instrumenta suae cepit uterque necis. Traxere Aemoniis cingula nexa rotis. Munera, venturi praescia fata ferunt. The story tells that shield-bearing Ajax and Hector of Troy exchanged souvenirs of battle. Priam’s son took the sword-belt, Telamon’s descendant the rigid sword, each accepting the instrument of his own death. For the sword destroyed Ajax, and the belt, attached to Thessalian wheels, dragged the dead Hector. So the gifts which enemies give to enemies, seemingly doing honour, knowing what is to come, bring doom. uterque suae mortis instrumentum accepit. 1. The gifts of enemies are no gifts. See Sophocles, Ajax 665, where Ajax so speaks of the ill-fated sword he had received from Hector. 2. See Homer Iliad 7.299, for the occasion in the Trojan War when Hector (the Trojan hero, son of Priam) and Ajax (Telamon’s descendant, one of the best fighters on the Greek side) met in single combat and afterwards, the honours being even, exchanged gifts. (Ajax was carrying the vast shield for which he was famed). Later, he committed suicide by falling on the sword he received from Hector ([A56a038] notes and [A56a223] notes). 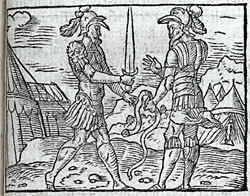 Hector was later killed in single combat by Achilles (prince of Thessaly, the Greek champion), who desecrated the body by tying it behind his chariot (it is suggested here that he used the sword-belt Hector had received from Ajax) and dragging it about before the eyes of the Trojans. See [A56a057].